They made a video game out of Andrei Tarkovsky’s Stalker, so why not Twin Peaks. Twin Peaks is, of course, a seminal cult TV series, a surrealist soap opera spun out of the mind of David Lynch. When it came out in the late 80s, America was seized with the show’s central mystery – who killed Laura Palmer? A tortured blonde beauty queen who wound up dead, wrapped in plastic. Its first season (US viewers can watch it on Hulu) was easily one of the best ever on television with great characters, inside jokes and just enough Lynchian weirdness to unnerve a mainstream audience without totally freaking them out. Too bad, then, that the quality of the show’s second season went off a cliff. You would expect a video game about the series to be about the search for Laura Palmer’s killer, but no. 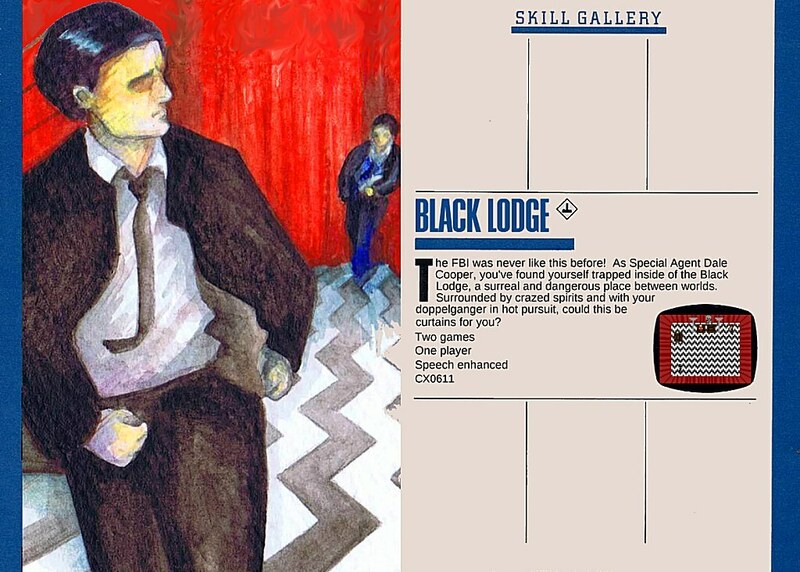 Instead, the game, an Atari 2600-style work called Black Lodge 2600, is a riff on the show’s final angry episode. In that episode, FBI agent Dale Cooper delves into the otherworldly Black Lodge, which, in spite of its name, is decorated primarily in red curtains. There, Cooper is confronted by his doppelganger. Lynch’s Jungian obsessions have never been as bald as in that episode. A day in the FBI was never like this before! You are Special Agent Dale Cooper and you’ve found yourself trapped inside the Black Lodge, a surreal and dangerous place between worlds. Try as you might, you can’t seem to find anything but the same room and hallway no matter which way you turn. Worse yet, your doppelganger is in hot pursuit! You have no choice but to keep running through the room and hallway (or is it more than one?) and above all else, don’t let your doppelganger touch you! You’ll find quickly that you’re not alone in the Black Lodge, though your friends are few and far between. Not only that, the Lodge itself seems to be actively trying to trip you up at all times! You’ll be dodging chairs and crazed Lodge residents all while trying to keep your own sanity. How long can this go on? Based on this description, I can’t tell if this game is compelling or if it will merely evoke the same feeling of existential futility I feel every time I call Time Warner Cable. Watch a video of the game below and judge for yourself. Or start downloading the game and the manual here. I like Retro game. And this twin peak game is really nice.